I survived Back to School and am enjoying a breather before the insanity that is Halloween-Thanksgiving-Christmas descends upon us. It seems like the perfect time to review what’s been going in the EBM household this past month. Below, you’ll find a smattering of Facebook posts that only a few of you saw (since Facebook only allows a few of you to see unless I pay to promote them!) plus some other ditties about me and the kids that hopefully make you smile/brighten your day! My daughter, 7, seems to like second grade well enough. I’m a bit worried, though, because she keeps getting stickers for being the quietest student or the student with the neatest handwriting. Yes, those are good things, but she’s been rewarded for being quiet and neat at least 3 times so far. I want her to know it’s okay to speak up and write passionately sometimes, rather than neatly. But, really, I’m proud that she listens and is on the teacher’s good side. Post by Experienced Bad Mom. Meanwhile, I am thoroughly enjoying 6th grade because I don’t have to sign homework or a planner. My son’s on his own, peeps, which is how I think it should be. Do his homework or not, it’s on him. NOT ME! He does get home from middle school sometimes before I get home from work. I’ve gotten 2 phone calls while driving home that made me heart stop when I saw it was the home phone number. Is he okay? I worried. And I hosted my parents for a weekend. Good thing I was prepared! What were the highlights of your September? Don’t forget you can catch my Facebook status updates (sometimes when Facebook feels like it) by following my page. …”sometimes with Facebook feels like it”… you kill me. I’ve been catching up on your blog! Just awesome! Thanks! Glad you’ve wandered back into the blogosphere! You have a Facebook page! Heading over right now to like it. Lovely. BUT first may I say you got my day off on the happiest of notes. Thank you. I too am delighted I am not a grade two teacher. Good to know there’ll be vodka when I visit. Can we pop by the Farmers’ market for some donuts? I make weird references to children’s cartoons at work and nobody gets it. My boss is a grandfather and my two other co-workers are childfree and childless. Rabia @TheLiebers recently posted…#TuesdayTen: There’s No Such Thing as a Stupid Question! And thanks for telling me I made you smile! That always makes me happy! Cade clogs the toilet. Yeah. Chris, one day we will meet and have a great time!! ROFL about Cade. I didn’t see that one coming and it made me giggle so hard! I do not want to know about clogged toilets either. Seriously kids, you know where the plunger is. It’s not rocket science! On to October! I love these! 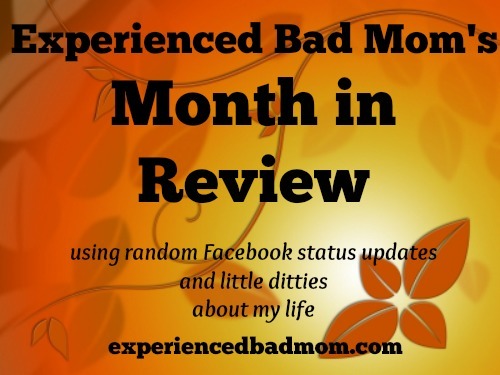 I can’t believe I wasn’t a fan of your Facebook page yet…I am now! Hopefully Facebook will actually show me more of these gems.